Due to some unexpected life challenges this week, our schedule has changed – leaving us more time at home to plan and make meals. Okay, I’ll be honest here – leaving TIM more time to plan and make meals (yes, I know I am incredibly lucky to have a partner who loves to cook and feed me). But so far it has worked out in our favour. I’m starting to get bit frustrated with the power of choice having been taken away from me, and I would really love to have a nice, juicy steak in front of me right now. I tried to make plantain chips last night, but our plantains aren’t ripe enough yet so they weren’t very satisfying. For lunch yesterday we had cabbage salad with a poached egg. Tim made croutons out of bread and olive oil (cube the bread, toss in olive oil and bake at 375 until golden brown), and while the salad was good, it didn’t satisfy my healthy appetite. 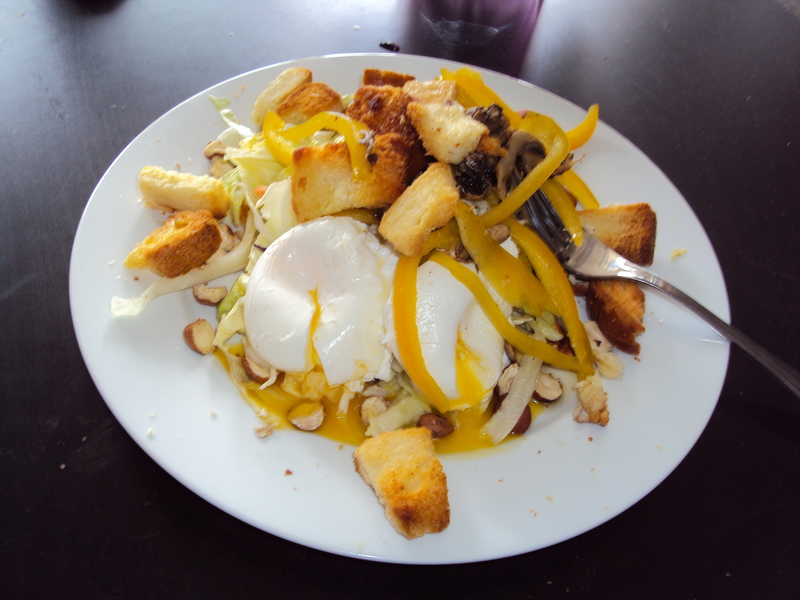 On the salad was yellow peppers, mushrooms, filberts (hazelnuts), a homemade dressing and croutons. For dinner it was plain ol’ mac ‘n cheese, which would have been awesome if we had ketchup! I think Tim sees this as more or a culinary challenge then anything, so for now it’s all well and good cooking with different foods, but I think that might be a different story by the end of the week. 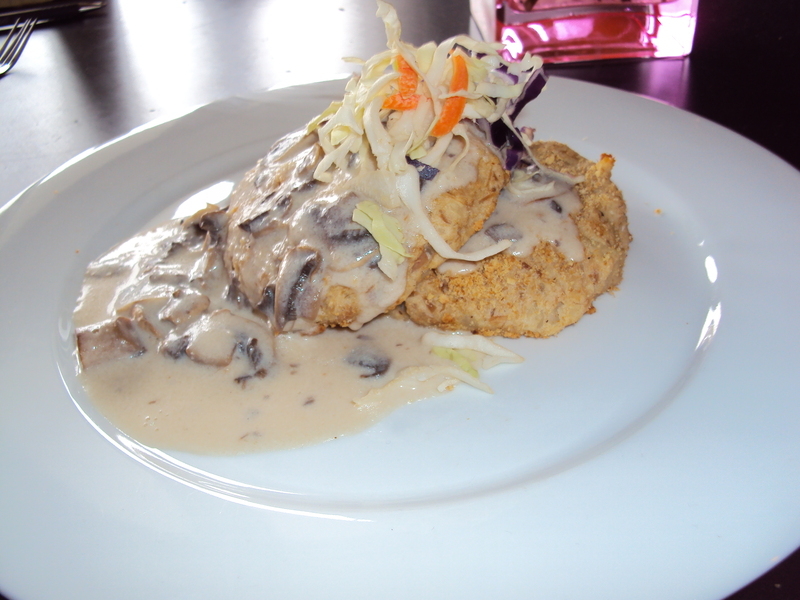 For lunch today we had baked tuna and potato cakes with a homemade mushroom sauce on top, and a bit of cabbage for a veggie fix on the side. Tim made lots of these, which is good because they will be excellent leftovers – I prefer mine fried in some oil for extra flavour and crisp. I think I’ll have some for dinner tonight! Everything Tim makes looks amazing! You are one lucky lady miss Leah. Way to go Tim! He’s almost making this look too easy, although I’m curious to see what your meals will be like by the end of the week.